In 2008 while living in Japan, I was finally able to play MOTHER 3, a recent (at the time) sequel to a cult hit video game that I had loved as a teenager. My brothers and I owned a Super Nintendo and a copy of EarthBound, by far the house's "preferred game." Released in 1994, it was a role-playing game set in rural America, starring four "normal" kids (or as normal as spunky psychics, princes and genius teenagers can get, anyway). Years later, the sequel MOTHER 3 got a Japan-only release. For me, it was perfect timing. Uncertain how to make Japanese-speaking friends, I had been hanging out mostly with fellow JETs and exchange students from the nearby university. I spent a lot of time in my apartment chatting online with people back home and listening to Internet radio. 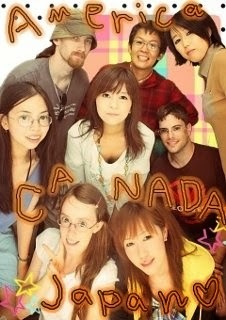 And as it happened, that was where I had the good fortune to meet my first real Japanese friends - not in Japan, but on the Internet. This could turn into a much longer story (and my social life isn't actually what the post is about!) so to keep it short, I'll just say that I got involved with a certain well-known EarthBound community and encountered a Japanese fan of the game within it, Mana. She was about my age and lived in Gunma-ken, a prefecture north of Tokyo. The two of us arranged a meeting during one of my visits to Tokyo and hit it off, and from then on, whenever I was in the area, I made an effort to see her and her friends that I had gotten to know. All were fans of the MOTHER series, so I went from a fairly small amount of fandom involvement to quite a lot, very quickly. Japan was a good place to be at the time for fans of this 20-year-old series - aside from MOTHER 3's relatively recent release, there had actually been brand-new merchandise released in arcades (Game Centers), The King of Games was selling official t-shirts out of a shop in Kyoto's Teramachi, thirty minutes from my apartment, and you could still buy the special MOTHER 3 Game Boy Micro in stores - I still regret not owning one of these! I struggled through reading the blog of MOTHER creator and copywriter Itoi Shigesato, and I went to LOFT on not one but two separate Januarys to buy his well-known Hobonichi Techo, a day planner with customizable covers and thoughtful quotes. I did not make the purchase on either occasion - after all, every year CLAIR sent us a compact, designed-for-JETs planner in the mail that I was quite fond of, and I also received a small calendar book from my school. While I wanted a techo because of the Itoi connection, I couldn't validate the expense when CLAIR's version was smaller, printed in English, and had subway maps and unit conversions on the back pages. None of the covers interested me enough to drop ¥3,500 on one, so I settled for simply looking them over whenever I visited Kyoto. There were other ways to show my MOTHER love, like this fancy colour-changing Ultimate Chimera shirt that cost an absolutely astronomical amount of money at the time. At one point Mana-chan and friends, myself included, attended a MOTHER event in Tokyo where I even ran into into two other English-speaking members of that community, one of whom was an expat JET like me - though a CIR, not an ALT - from a few prefectures away. We hadn't really known each other at the time, certainly not enough for me to recognize them offhand, but I was completely gobsmacked to spot someone in the subway station wearing a Ness t-shirt, and rushed up to them immediately to say hello. It's been some years since that event, and though MOTHER influences my life to this day, my active involvement has waned pretty considerably since leaving Japan. Not so of the JET I met at the event in Tokyo, Lindsay - she now translates and localizes for the company belonging to the creator of the MOTHER series, Hobo Nikkan Itoi Shinbun! I can't tell you how awesome it is to see a fan succeed not only at entering the industry professionally, but to have the incredible good fortune (not to mention the moxie to go after it in the first place!) to work with Itoi himself. So when word got out that Hobonichi was releasing an English version of the techo, translated and localized by Lindsay, I decided it was finally my year, despite having converted over pretty thoroughly to Android's convenient Google Calendar access. Typically, I have never been great with keeping up planners. Not since high school have I used an agenda on a regular basis. 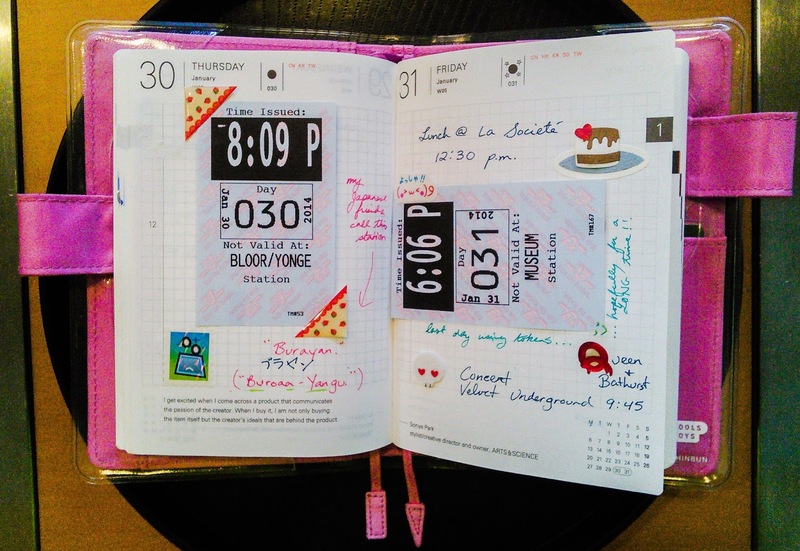 But my techo's design and ease of use (can't bring my phone into company meetings!) and stylishness and POCKETS has driven it home. I use it for writing fiction ideas, dates and times and details for stories, copying the office calendar down so I can see it at home, collecting movie and concert ticket stubs, noting what foods I liked at restaurants and how much I spent, and more recently tracking Bitcoin gains and losses. I also get to use stickers I brought home from Japan and my immense Muji pen collection, and imagine my surprise when I discovered that two of the other staff in my office also have Hobonichi techos! It's been a bit tough carrying around a book all the time when I cart around plenty of heavy things in my purse, not to mention switching from digital back to analogue again, but I'm already dreaming about putting my techo on the shelf at the end of the year and having this record of 2014 to flip through again someday...it's much more personal than reading back through Twitter logs! I guess I can't possibly be shocked that MOTHER continues to exert that subtle influence over my days. I might even have to pull out the big guns and use some of my carefully hoarded Mr. Saturn stickers. What are you waiting for!? Start your techo life!